Danish Army Specific: Received under MAP around 1960. s/n 8R1-9999. The dozer (with the dozer blade removed) is towing a Heil OC-9 scraper. Historical: The Caterpillar D8 was introduced as model in 1935, and was equipped with the six-cylinder D-14000 engine which developed 144 hp. The 20 inch wide tracks were driven through a 6-speed gearbox. Maximum drawbar pull was 12,75 tons. US Army designation for the D8, which was a standard M1 heavy crawler, was "Tractor, Full-Tracked, Low-Speed, DED, Medium DBP. Used for general bulldozing, pan pushing, tree dozing, scraper towing and other types of construction work. 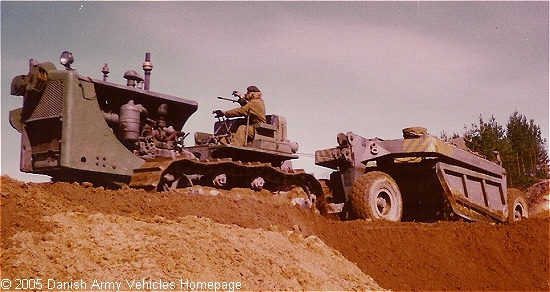 This Caterpillar machine, which was produced between 1941 and 1945, was a standard dozer, widely used in all theatres during WW II by the US Army. Length: 4.77 m (186 inches), w/dozer 6.10 m (238 inches). Width: 2.60 m (101 inches), w/dozer 4.10 m (160 inches). Height: 2.15 m (84 inches), without cab and exhaust pipe. Weight: 16.600 kg (36.520 lb. ), w/dozer 20.100 kg (44.220 lb.). Engine: Own 6-cylinder, type D14000, 20.430 cm3 (1246 cubic inches), liquid cooled. Horsepower: 144 at 1.200 rpm. without preparation: 1.10 m (43 inches). Fuel capacity: 260 liter (57 gallons). Additional: A two cylinder vertical gasoline engine was fitted to the left hand side of the diesel engine. This starting engine could be started from either top of engine hood, or from the front or from left hand side. The starting engine exhaust pipe provide preheating for main engine air intake. The machine could be fitted with following cable controls: Either a front mounted single drum Le Tourneau cable control for bulldozer only, or a rear mounted double drum cable Le Tourneau control for scraper or bulldozer. Some machines with front cable control have rear mounted Hyster D8N 25 ton winch.